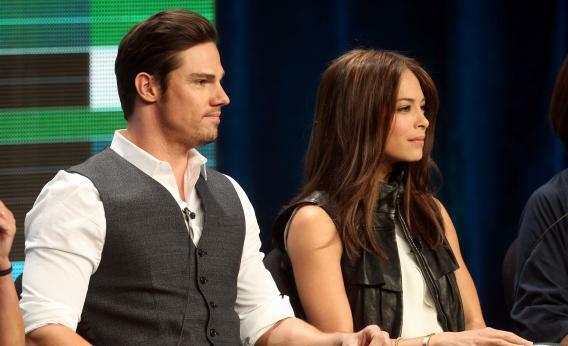 CW's Beauty and the Beast remake and TV's obsession with monsters and the women who love them. Jay Ryan and Kristin Kreuk speak at the Beauty and the Beast discussion panel during the CW portion of the 2012 Summer Television Critics Association tour at the Beverly Hilton Hotel on July 30, 2012 in Los Angeles, Calif. The CW, the smallest of the big five broadcast networks, is known for the strikingly good looking people it puts on its airwaves. On Monday at the Television Critics Association press tour, network executives unveiled their remake of Beauty and the Beast, the 1987-’90 series that starred Linda Hamilton and Ron Perlman as a lawyer and “lion-man” making New York a better place. * And it was no surprise that critics immediately noticed that the Beast was a hunk with a fake scar by one of his eyes rather than an actual monster. Sherri Cooper and Jennifer Levin insisted that their Vincent (Jay Ryan) is a beast on the inside instead of the outside, and ended up playing right into one of TV’s current favorite tropes: romanticizing troubling relationships between violent men and the women who adore them. The CW is a network aimed primarily at young women. And there’s a difference between loving someone with depression or PTSD and loving someone who regularly goes around killing people in New York City in the name of vigilante justice, or encouraging a woman to chase after a man who screams at her and threatens her. “He’s got the baggage, but … he’s not attacking her,” Cooper said. And Ryan suggested that the setup was fine because the difficulties were mutual: “Catherine gives it as good as she gets,” he said. But even if Vincent isn’t going after Catherine, there’s something disturbing about casting men so damaged they kill in a tragic, heroic light. Beauty and the Beast isn’t the only show coming to, or returning to television this fall that explores those themes. On Dexter, the last season ended with serial killer Dexter Morgan’s adoptive sister Deb concluding that she is in love with him, only to discover him in the act of murdering another serial killer. In Homeland, Claire Danes’ Carrie Mathison fell in love with a man she believed to be a terrorist. Sons of Anarchy contrasts motorcycle gang leader Jax Teller’s violent profession and his tenderness toward his girlfriend and sons. All of these shows invert the idea of a man who’d be willing to use force to defend the woman he loves or his family. Instead, the violent heroes mark the women they love as special by restraining their violent tendencies around them. Dexter, from his childhood, has restrained his urges to murder around Deb lest he frighten or upset her. Around Carrie, former prisoner of war Nicholas Brody finds peace, rather than turmoil. And Jax’s stepfather, Clay Morrow, is marked as a truly damaged man when he violates the sanctity of his own home and beats his wife, Jax’s mother Gemma. Violence, in these cases, is normal rather than something deployed when every other effort to protect someone or to resolve a solution has failed. And they rely on the very traditional idea that women are a calming, domesticating presence, even as these shows add a sense of danger to every interaction women have with men. What happens, they almost never bother to ask, if these very violent men stop loving these women and turn their talents for violence and intimdation against their own families, violating the sacred circles that mark the women in their lives as special. It may be outwardly appealing to escape into a fantasy of a man who will change his nature for you. But that’s a risky, dangerous premise. And viewers who swoon over Beauty and the Beast (which suffers from deep and abiding silliness other than its romantic view of damaged men) might be wise to check out Breaking Bad to see what it looks like when a man’s ability to protect a woman is turned against her as a tool of intimidation and control. Men may be violent and emotionally abusive because of damage they suffered. But that doesn’t mean that their behavior is charming, or excusable, or that Heathcliff or the Beast should be anyone’s dream boy. *Correction, July 31, 2012: This post originally misspelled Ron Perlman’s last name.